It was 20 years ago this fall that we embarked upon a journey of trust and obedience – unlike anything we’d experienced before – that continues to this day. We started with a desire to serve, not knowing where or whom. We were open. God led us to Kyiv and changed us from within. The nation of Ukraine remains on our hearts. We recognized a unique opportunity to impact a generation by reaching out to individuals with the truth and grace of the gospel, trusting that the fruit of our investment would actually make a historic difference. This has only happened thanks to the ministry partnerships, the prayer and financial support, which have been a part of our lives ever since. Urgent implications for the vulnerable, particularly to human trafficking. It is hard to express how deeply these events are connected in our hearts. We read this morning that demonstrators are occupying the Trade Union building in Independence Square. In 1995, that building’s façade sported a 40-foot hammer and sickle. Jim was there every week, leading Bible study and prayer with civic leaders, emphasizing the role of faith and morality in leadership. 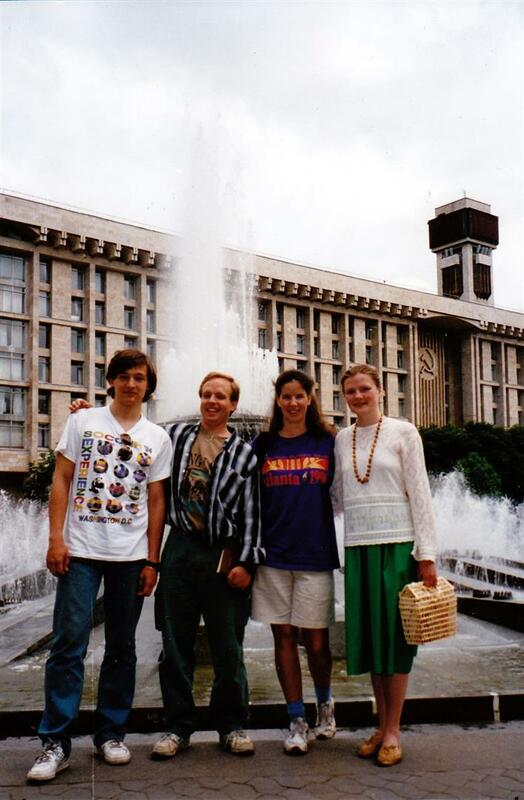 Spring 1995: On Independence Square with a young Artyom and Marina Kluchnikov: Trade Union building in background. We’ve seen that protecting the lives of people who are vulnerable to dangers like HIV infection or human trafficking connects both with the work of discipling the nations and this week’s current events… vulnerability, with risk of huge personal and social consequences, increases dramatically when moral dysfunction at high levels becomes the norm. Thus, we pray not for political parties or agendas, but for people to “stand firm against the wiles of the devil” (Eph. 6:11). These battles in the political and economic spheres have very real impact on the lives of people. From the very beginning of our time in Ukraine, Liz was involved in Bible studies at women’s dorms throughout Kyiv. Over three years of Friday nights, she saw the battle raging in the minds and hearts of each young woman who, seeing no hope for a better life in Ukraine, entertained “opportunities” which put them at great risk. A generation with hope and faith might persevere, but for those whose hope has been crushed out over time, the allure of promises “too good to be true” can be irresistible. Oct. 2007: Liz’s women’s group meeting for a retreat in our “khata” outside of Kyiv. The same optimism that led us to invest in the first generation of post-Soviet Christian leaders in Ukraine still animates our thoughts and dreams for the church in Europe. We dream and pray for cities transformed by the hope and power of the Gospel. As such, we cannot sit idly by while such events are playing out in the city we love. We are moved to prayer that Ukrainians will be able to take their place in the spiritual renewal of Europe, which must include both bold proclamation of the good news of Jesus and living out the demands of His Father for justice. We believe that the church in Europe is not dead, only sleeping… perhaps events like those unfolding right now in Kyiv will help awaken her. We have placed all we have and all we are in the service of that hope… as has been true from the start, we continue only with the prayers and support of those who also hold a stake in this hope. As we approach the end of the year we are in serious need of additional finances to pursue the opportunities we have to continue to serve the next generation of laborers and leaders in Europe. Please consider a tax-deductible gift at this time. We are passionate about these things, believing they are close to God’s heart… we are trusting that they are important to you as well. Please speak with God about sharing this opportunity to contribute with a friend or at church. Thank you for being with us in this journey.